Don't you dare smear guac on that slice. This is a beautiful and delicious national treasure. This is one of the most amazing natural wonders of the world. Avocado slices, maybe. BUT GUAC? and EGG? Melted cheese on melted guac on melted sauce? OH. Why would you want to mess with something so tasty and delicious? No one will ever love you like the insides of this box will. Pizza is hot to the touch of your lips. Guac is cold and perfect for summer. THIS IS HOW THINGS ARE SUPPOSED TO BE. This is not biology class. 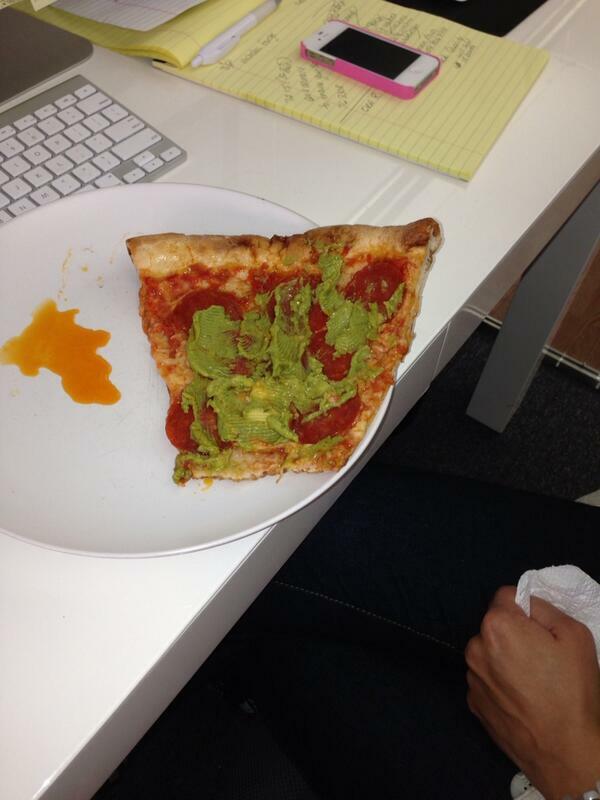 Stop trying to make the guac-pizza hybrid happen. That mysterious orange liquid is the natural discharge of disgust from your body. Guacamole: You are an essential and tasty dip. Pizza: You are greasy and delicious and perfect. But guac pizza? No one wants to hang out with you, guac pizza.